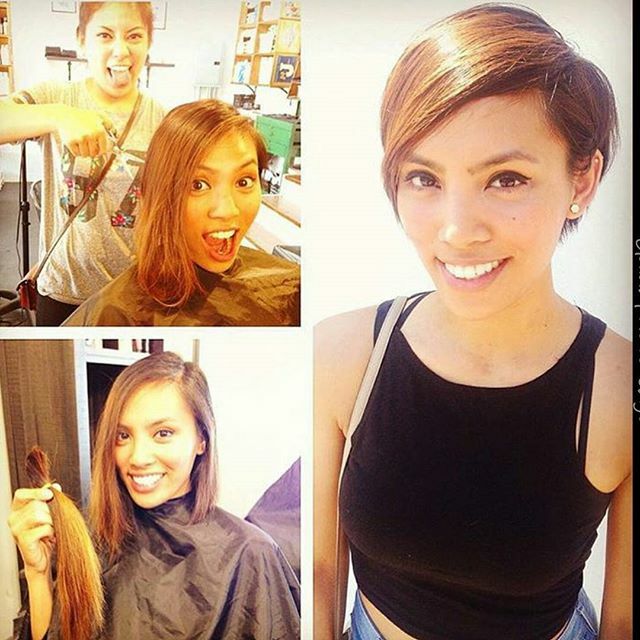 Ready for a new look? 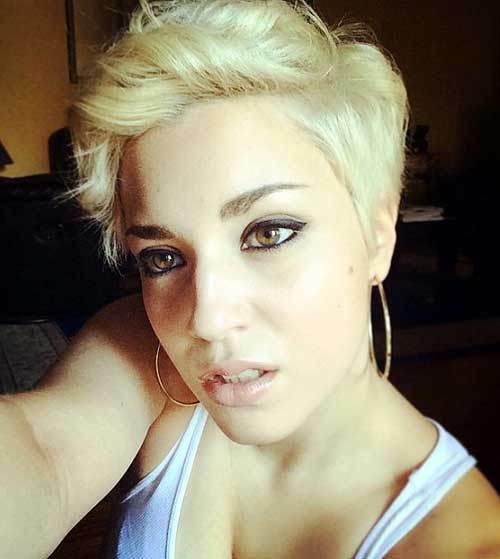 Well, this is the place to see the latest and best pixie hairstyles. 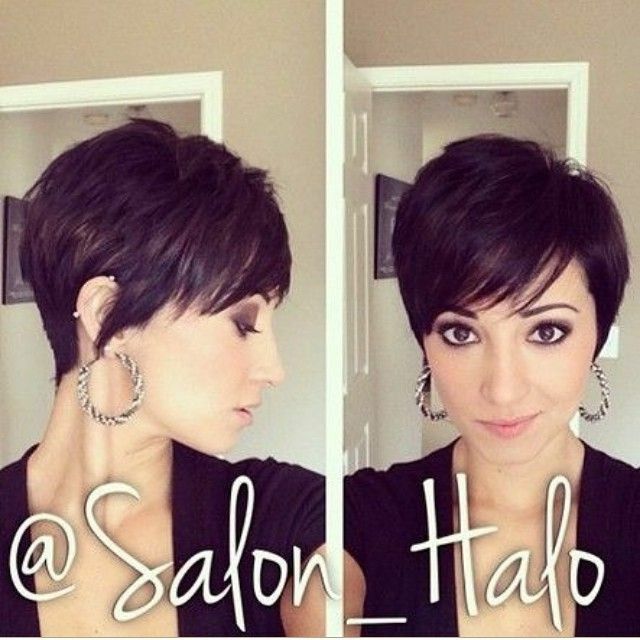 Choosing a face-flattering pixie cut can really improve your self-image. 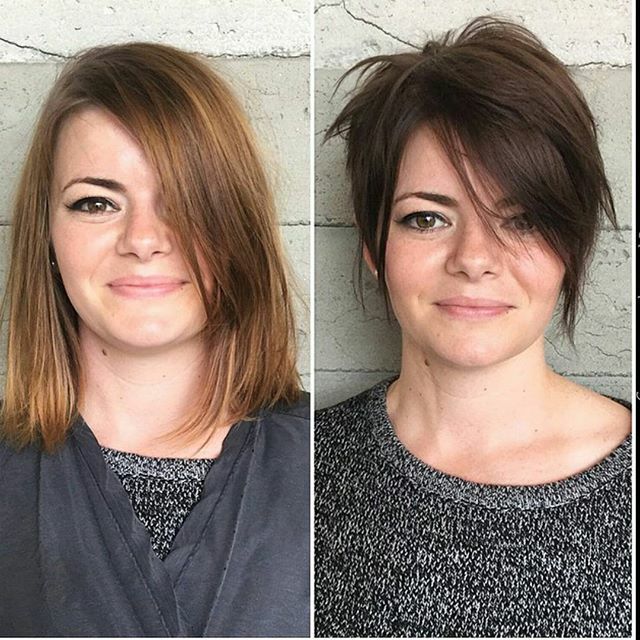 Just adding a different styling technique or the latest hair colors can work wonders when you’re bored with your current hairstyle! 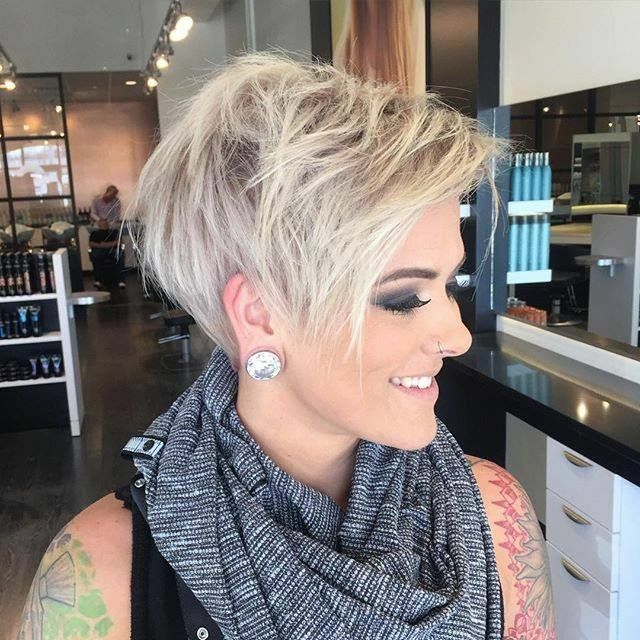 Remember, the most important thing is to find a fashionable hairstyle and color that bring out your best features, so don’t hesitate to take different ideas from several different images in today’s fun, funky, classy and carefree pixie hairstyles for you! 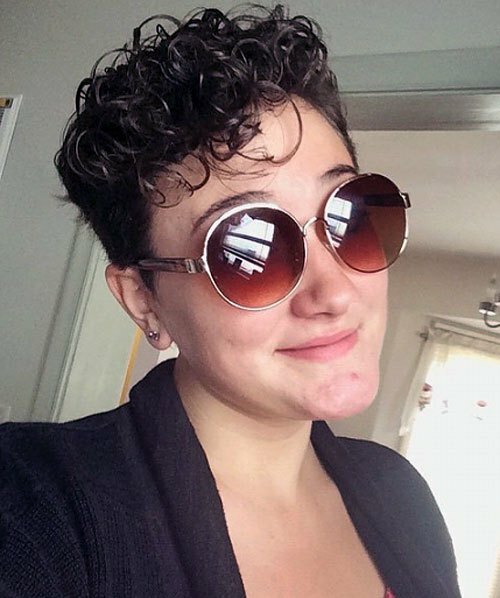 No wonder this cute model’s looking smug, she’s found a way to control her curls in an easy-care and flattering pixie cut! 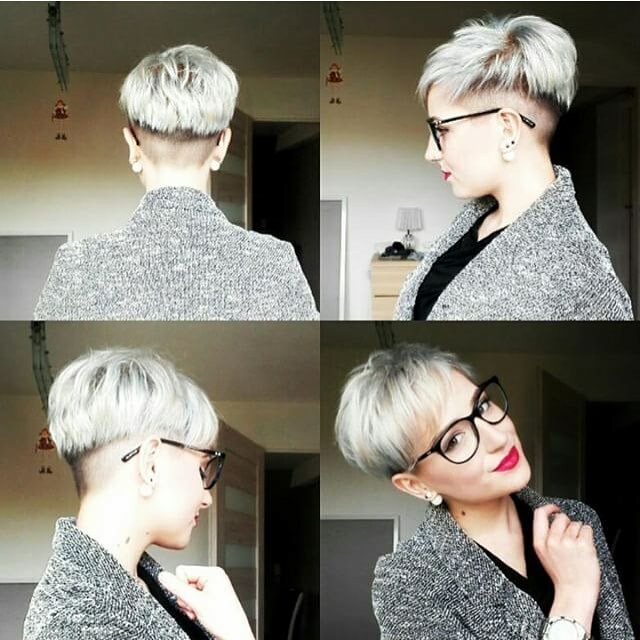 The short-back-and-sides cut has a longer top trimmed into a square shape. The square top balances out a long or narrow chin and the jaunty bangs soften and shorten a long face! It isn’t compulsory for brides and bridesmaids to have long hairstyles for the ceremony, or any of us for proms and parties! 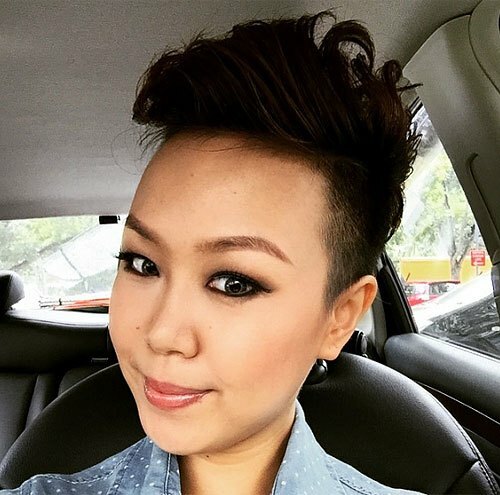 This smooth pixie on thick hair with a little natural wave is a very flattering style for round/heart or long faces. And adding a dainty silver hair accessory is the perfect finishing touch! 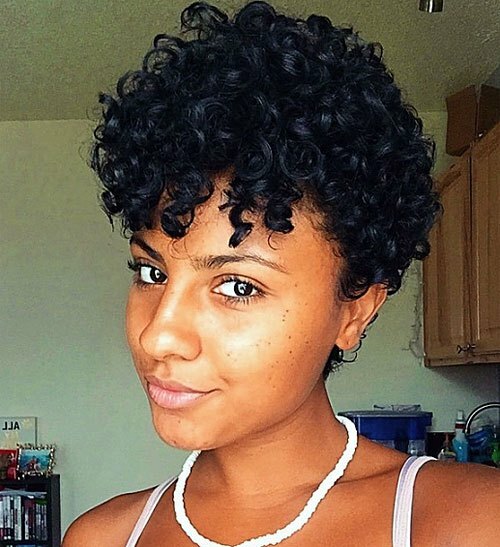 Bubble curls and soft ringlet bangs add a lively vibe to this jaunty pixie. 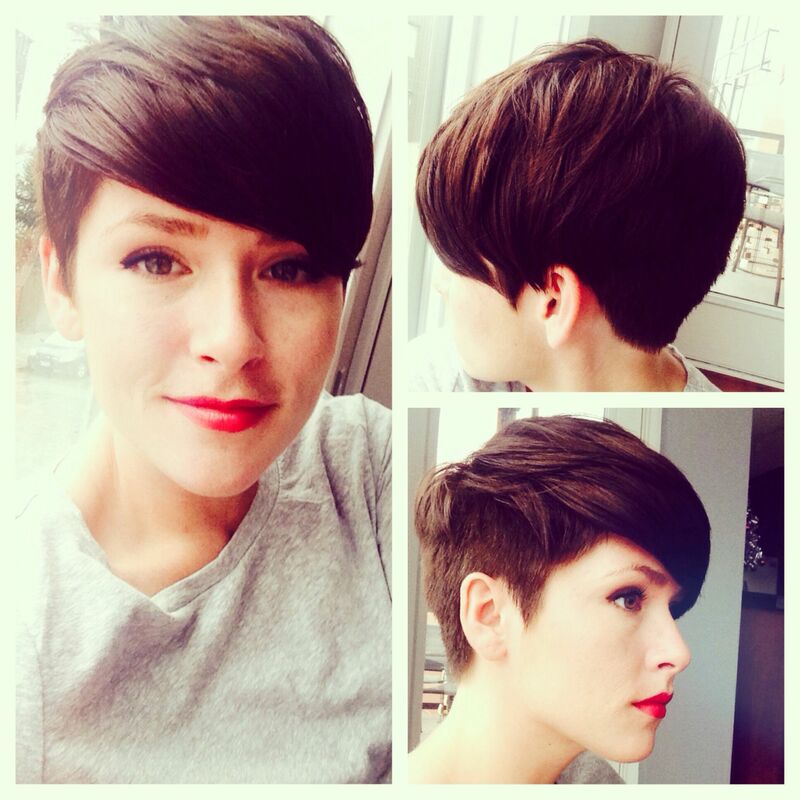 The hair has lots of texture and movement that reflects light from the glossy surface. Adding height helps faces seem longer and slimmer making this a flattering look for oval, round and heart faces. 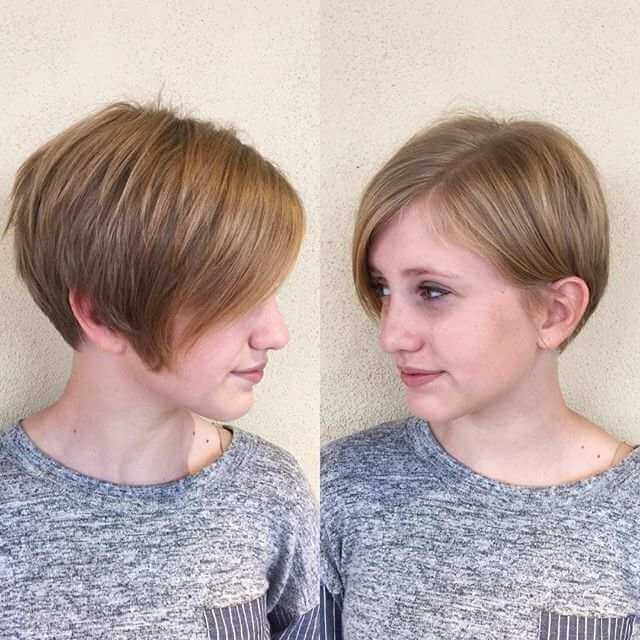 Here’s another jaunty pixie cut with a touch of asymmetry at the front. 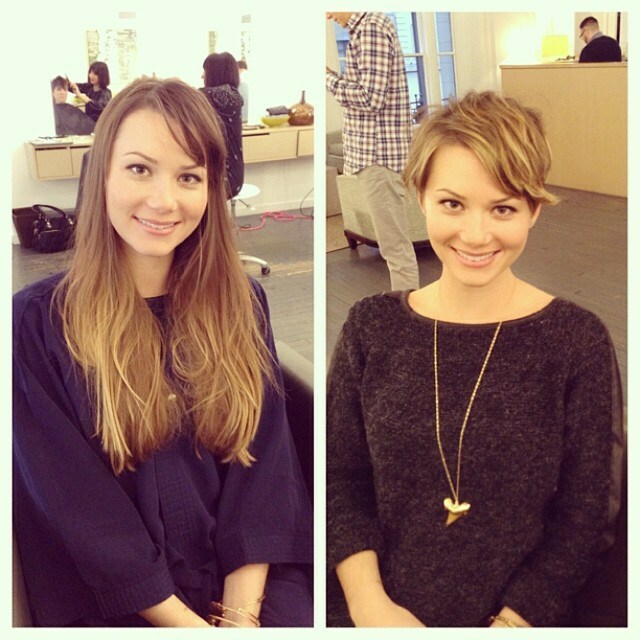 Off-the-face styling shows off a pretty, rounded hair-line and emphasizes a symmetrical oval face. The slightly asymmetrical shape above the forehead is a touch of ‘edge’ to break the perfect curves! Leaving the face bare and adding height on top will elongate your face shape and razored short-back-and-sides emphasize the effect. 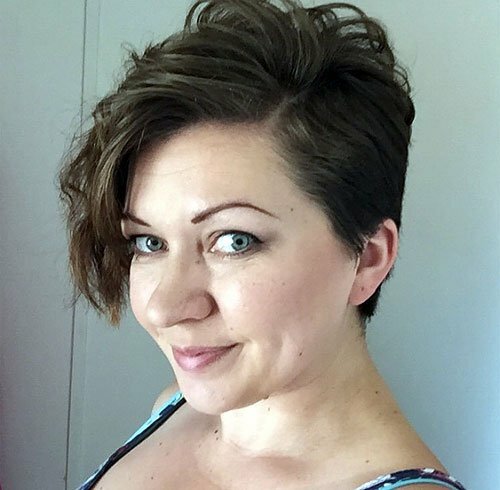 This extreme pixie with a faux-hawk shape and quiff shows the square hairline around the forehead, which balances out a narrow chin. Here’s someone who’s ready for a party, prom or disco session. 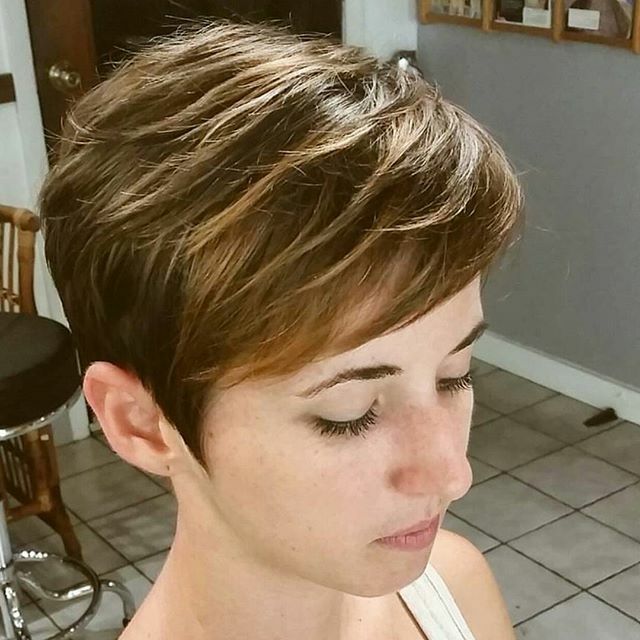 The long top of her pixie cut is teased for volume and above the light-brown roots cute, messy curls are highlighted in fine, pale-blonde strands. 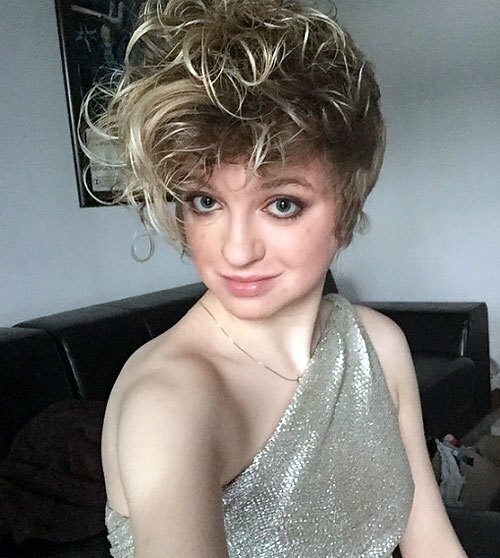 Messy bangs draw attention to the eyes and the vintage eighties vibe is completed by a fabulous silver lamé dress! 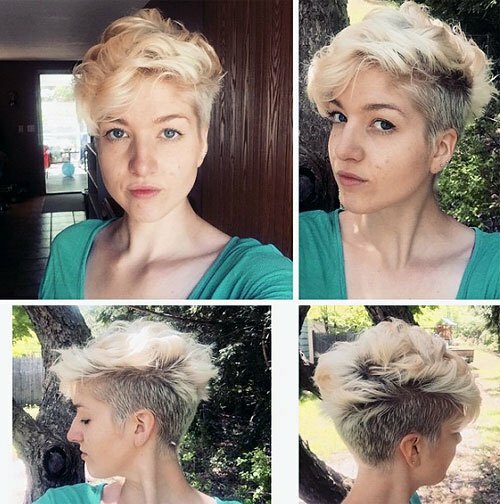 Here’s a sparky look that combines clipped undercut sides with a glamorous fauxhawk. 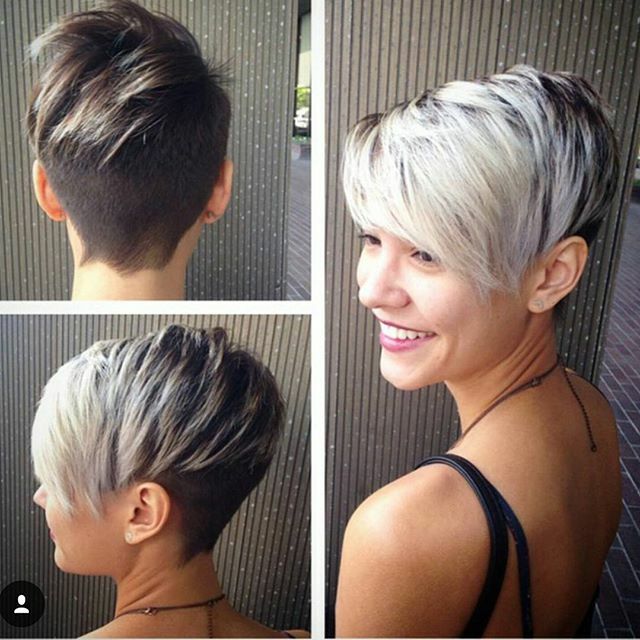 Close-cut sides and back have cute blonde tips creating fabulous texture and softening the short back and sides cut. 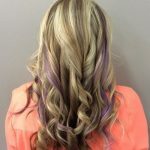 The large soft waves create flattering height on the top and side-bangs, in a fab fusion style for oval and round faces! 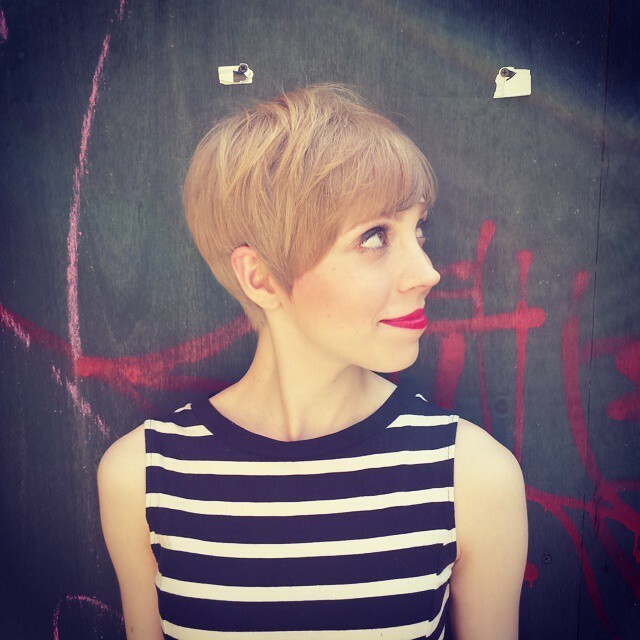 This easy-care, asymmetric pixie is expertly balanced to flatter a round or heart face, with a side-parting and bangs that fall over one side of the forehead. 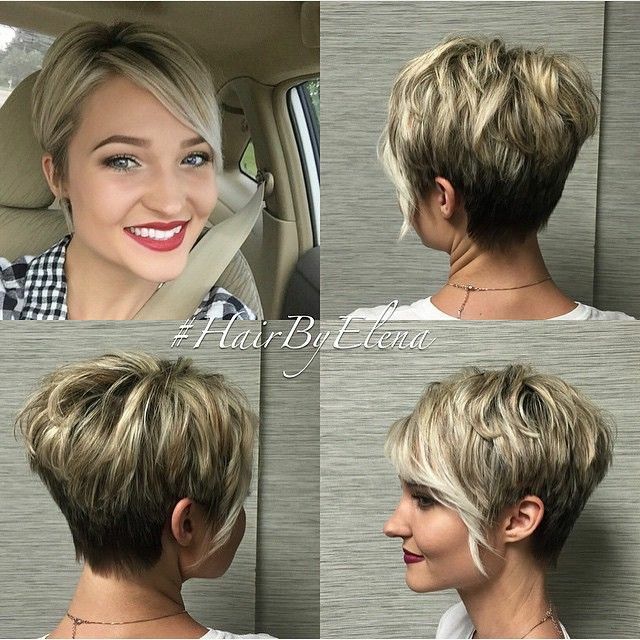 The short side creates a neatly styled profile and the long bangs accentuate the eyes with a touch of crimped texture at the tips. 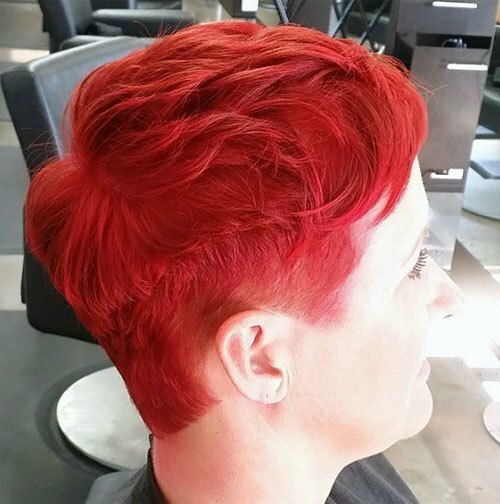 For a special occasion or a smart-professional look for work, this asymmetrical pixie with wavy texture creates a very attractive image. The lines are all soft from the blurred side-parting through the lovely waves falling across the forehead and over one eye to highlight the lips. Suits long, round, heart and square faces. 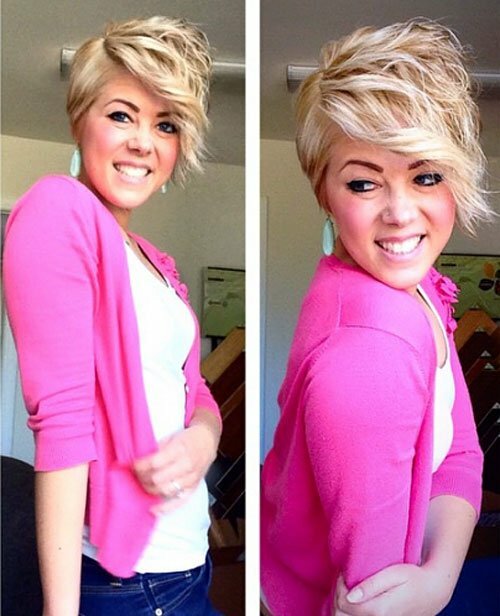 There’s something about a cute pixie haircut that brings out our fun-side and this asymmetrical pixie’s a great example! It takes the idea of a windswept finish and exaggerates it for a highly stylish new look. With soft, light-brown roots under light-blonde with trendy, white balayage, it’s a fabulously fashionable look for long, round and heart faces! 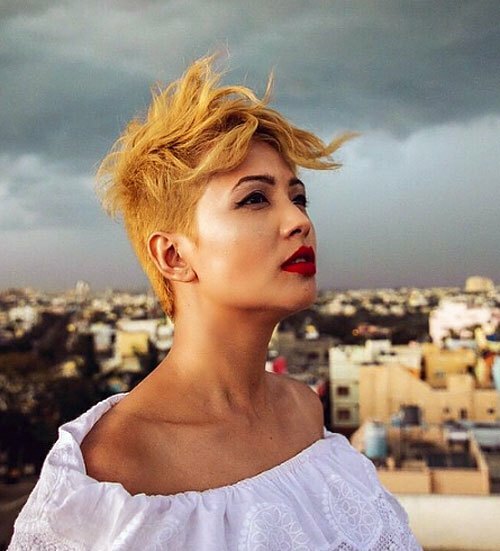 If you love urban-chic, this new hair color and styling option should inspire you! At first, you notice the absence of black roots, which softens the look and gives a classier vibe. Look again and you’ll see that the shadows are actually soft touches of silvery gray balayage! This ice-princess look is really hot! 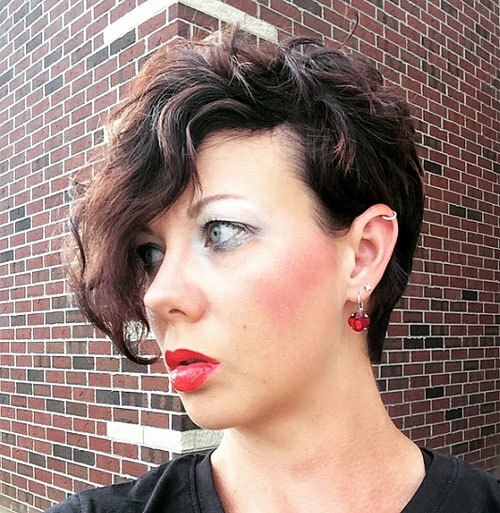 Thick hair with heavily textured razored tips is easy to style in a variety of trendy looks. 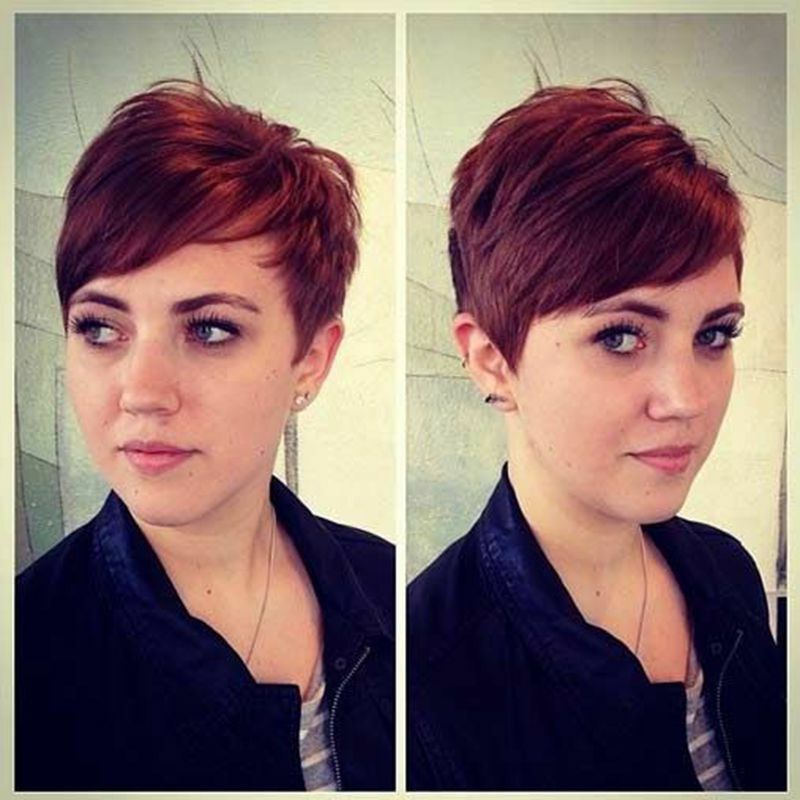 This forward-styled haircut has deep bangs with a sweeping curve to one side creating an asymmetrical look. 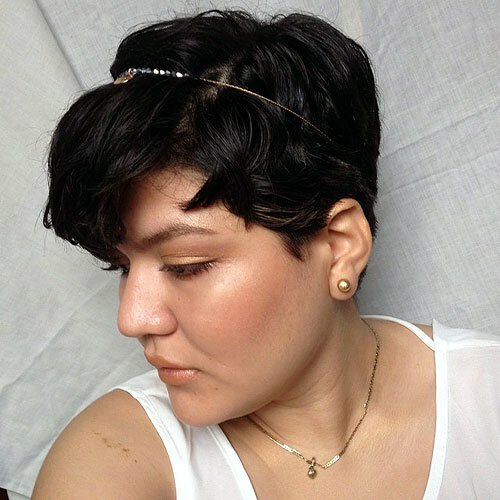 Shape and height are added to the crown with spiky straight-up strands in this casual style. 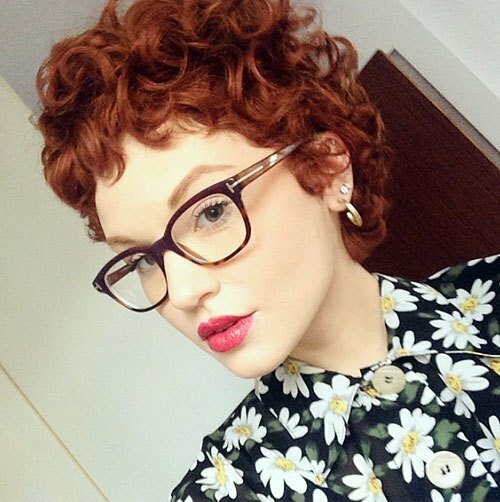 This pretty and feminine bubble-curl pixie worn with retro-tortoiseshell glasses captures the fifties vibe in a very stylish way. 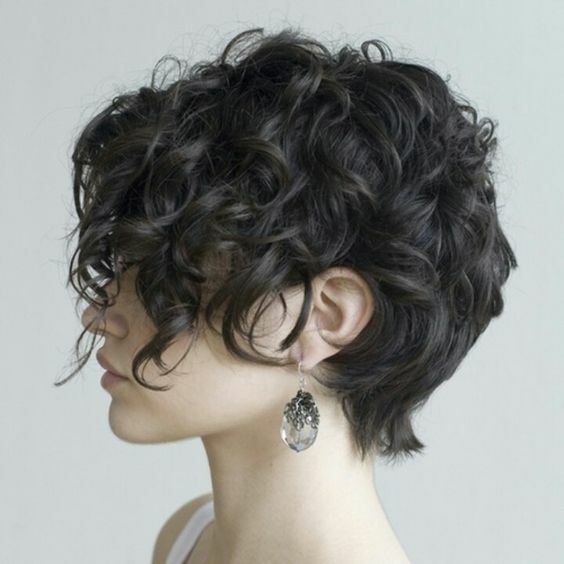 The short curly bangs soften the line down to the cute side-points and the tousled silhouette is full of texture and lively movement. 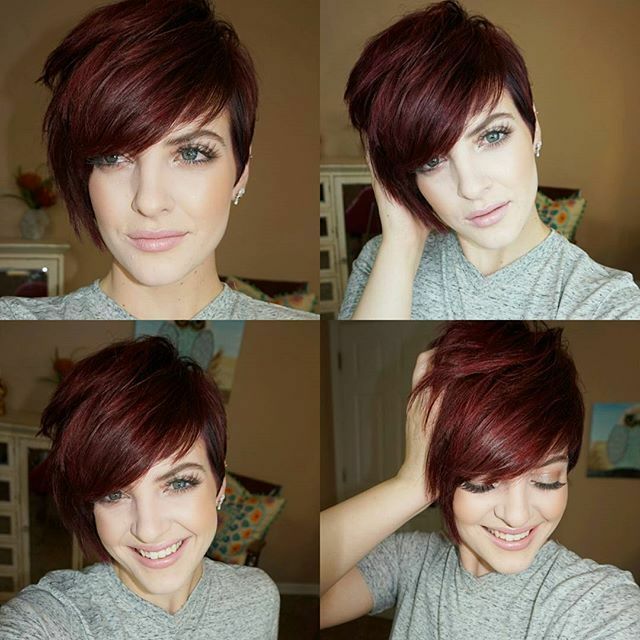 Here’s an exciting color option for your pixie hairstyle! It’s a great summer look – when we all take a more relaxed view of life! But it’s also a fabulous color for autumn fashions and as red as a holly-berry for a hot Xmas pixie, too! 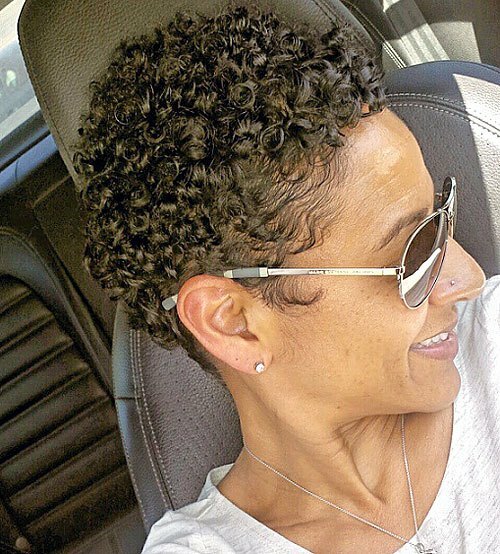 Here’s another cute, curly pixie style for natural hair. 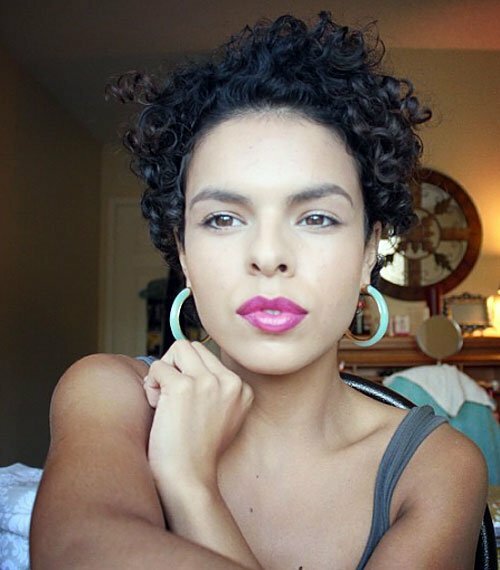 The perfectly coiled curls create loads of light-reflecting texture and lively movement for a feminine look. The bare forehead is great for showing off a nicely rounded brow and a softly wavy hairline framing the face. With a low side-parting and soft, side-swept waves over the top of the head, this is a great style for long, round, oval and heart faces. Creating a frame around the eyes and nose draws attention away from a wide forehead and narrow chin. And the dual neutral-blonde balayage produces a totally up-to-date finish. 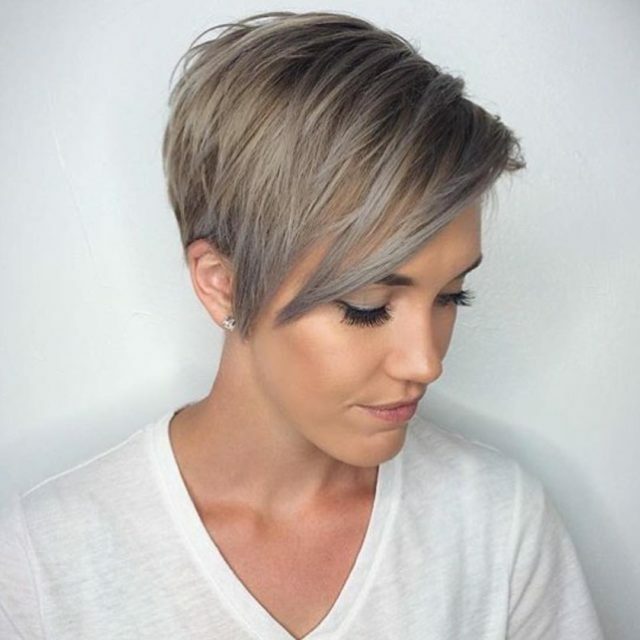 This is a totally feminine pixie cut with a very attractive soft-beige-blonde color over slightly darker honey-blonde roots. 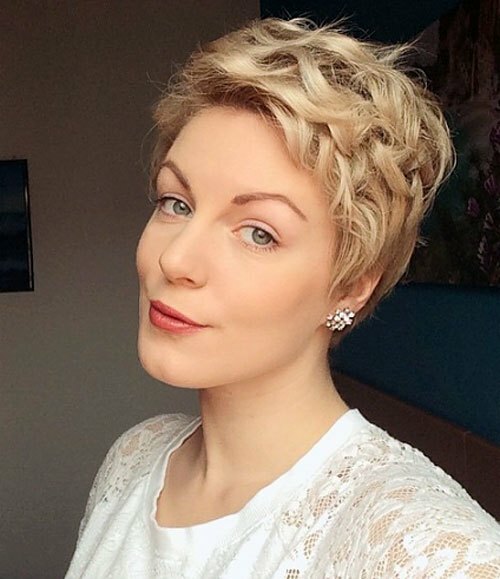 The side parting adds a little asymmetry and the unusually-shaped, defined waves with spiky tips create just enough edge to show this is a totally new pixie. 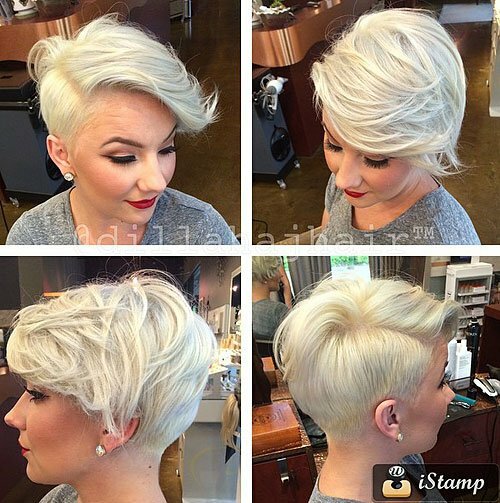 A casual wave above the forehead and no black roots really softens this platinum-blonde look. 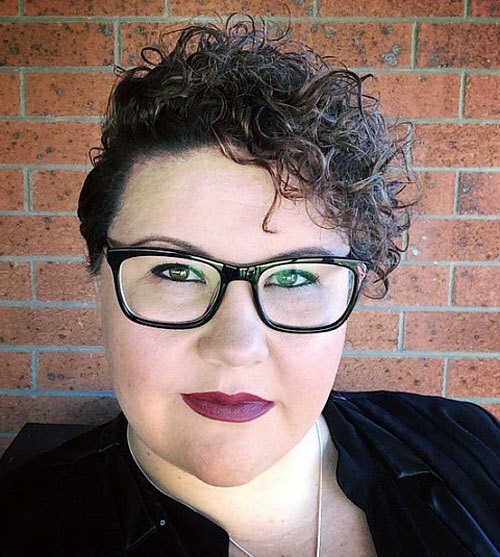 This cut creates a flattering frame around the top part of the face, accentuating the eyes, so it’s a great shape for minimizing a double-chin or a round face! 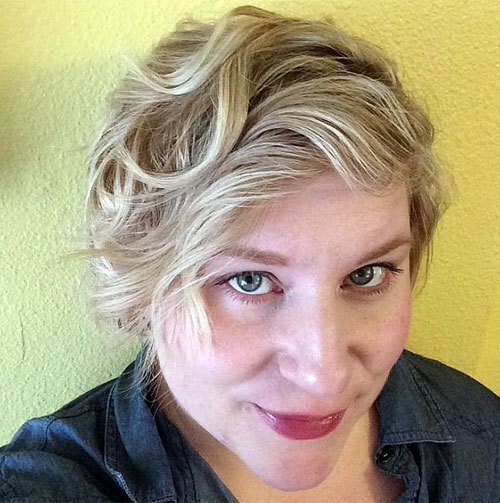 And all-over blonde is truly trendy, too. 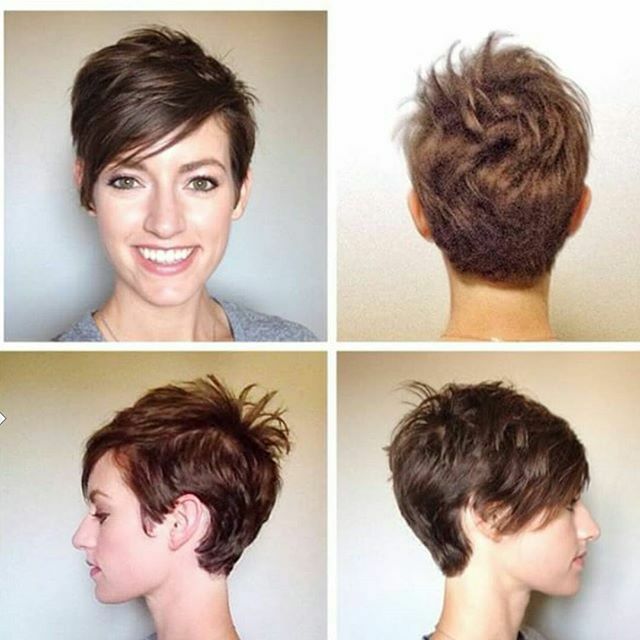 This image shows how the right pixie cut can draw attention away from a heavy jaw or wide face shape, by creating interest around the top of the head. The deep side-parting creates asymmetry to break the square face shape and curly bangs help to ‘cut-off’ the corner-width of the forehead. 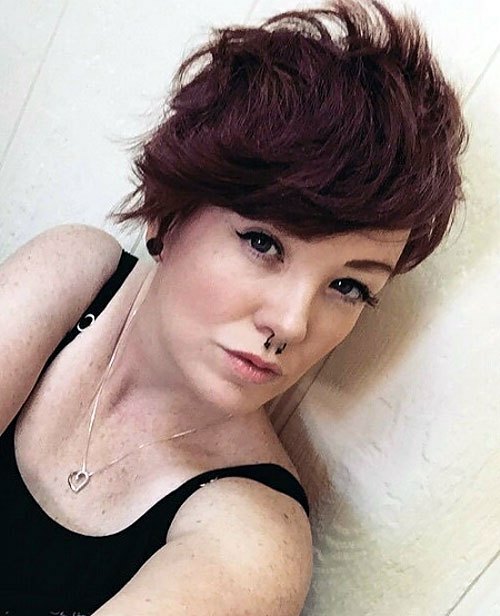 This edgy pixie contrasts with the feminine, lacy blouse for a modern look that shows you don’t have to wear long curls to be attractive and womanly! 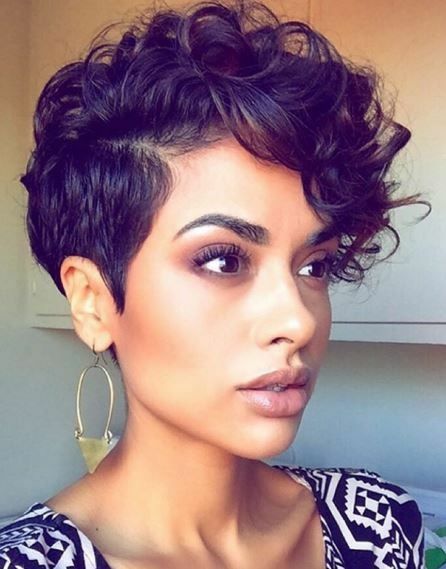 The short back and sides cut has cute, short side-points accentuating the eyes and matte-textured messy broken waves in a high-fashion faux-hawk. 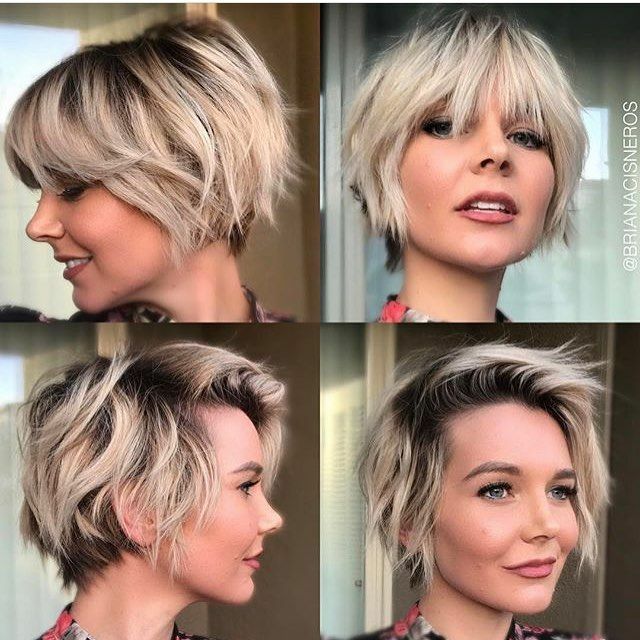 Fresh styles and balayage ideas for pixie hairstyles are never-ending this year, so keep checking back to stay right up-to-the-minute with the most popular and fashionable styles!